Tube complement: 12SA7 mixer/oscillator, 12SK7 IF, 12SQ7 detector, 50L6GT audio output, 35Z5GT rectifier. Approximately 12-3/4 inches / 324 mm wide. On the back board is written "VIB 6/30/59 filter cond 100 ohms res 0.02 cond." I had to replace VIB's filter condensers again, so this radio is running on its third set of filters. 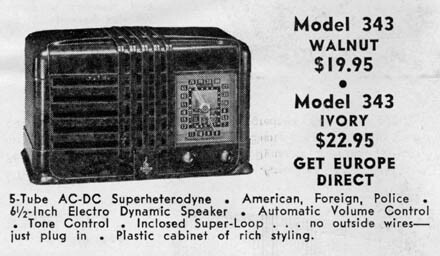 From a 1941 Emerson sales brochure. The ivory one cost $3 more. 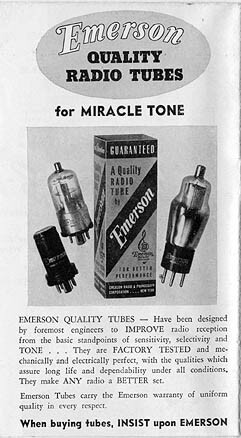 Emerson had tubes made for it by a tube manufacturer such as Ken-Rad or Sylvania. 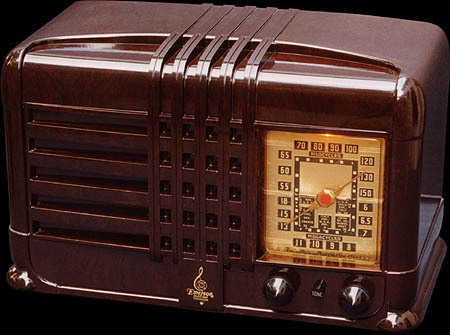 Most radio makers did this, and in this way they could get additional profits from the sales of their own brand of tubes. 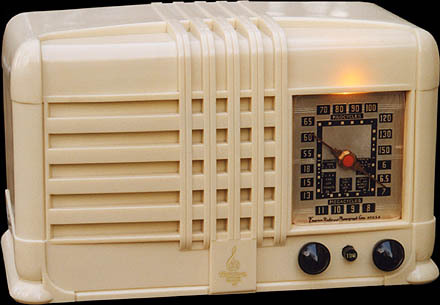 Just as Emerson does at left, each radio maker would encourage the sole use of its own brand of tubes in its radios. With the possible exception of a couple of "el-cheapo" off brands, all the brands of replacement tubes were of equivalent quality.